McKinlay & Peters Equine Hospital was the first veterinary practice to bring digital radiography to the region. This is an amazing tool that we use daily to image bone, both normal and abnormal. It is used during surgery to ensure proper placement of screws and plates. We also monitor bone healing with sequential images taken over time. The clarity of digital radiography is truly state of the art, offering not only the best images available but images that can be viewed almost instantly in nearly any location. Our newest acquisition is a cordless digital x-ray unit, one of the first in the world. You will love having an x-ray taken of your horse and then have the pristine image explained to you while standing at your horse’s side! It’s incredible! The ultrasound is one of the indispensable tools we have used to build MPEH. It is an integral piece of equipment that we use every day. We can image anything except for bone with the ultrasound. Bones can actually be imaged on the surface. Almost anything soft such as skin, muscle, ligaments, tendons, cartilage, internal organs, eyes, lumps, drainage tracts, etc., can be evaluated using the ultrasound, although it can also be used to guide needles for specific placement in an area for diagnostic or therapeutic purposes. Our digital technology equals that used in high quality human hospitals and is very portable! 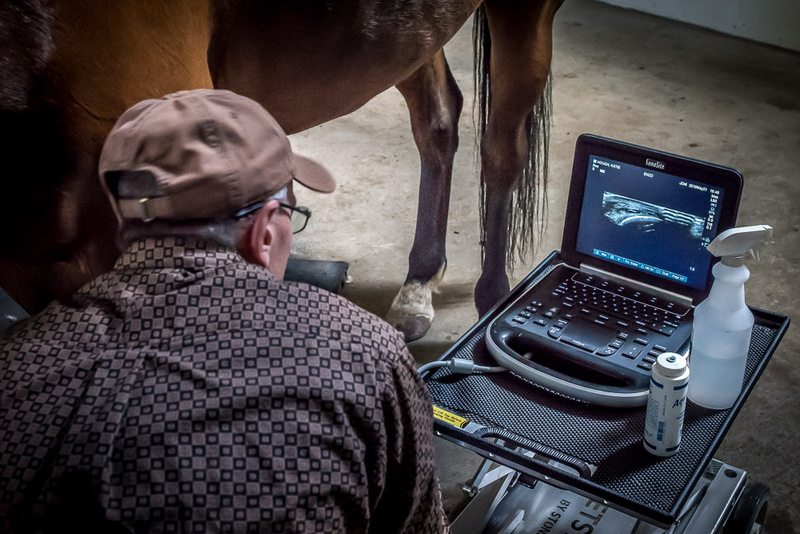 McKinlay & Peters Equine Hospital operates both 1 and 3 meter Video Endoscopes. This gives us the opportunity to accurately diagnose and properly treat problems in the sinus, guttural pouches, pharyngeal area, trachea, lungs, esophagus, stomach, uterus, urethra, and bladder of the horse. It is very rewarding to look into these areas of a horse and actually see the problem on the monitor with the use of these scopes. It leaves no doubt! At MPEH we have been performing surgery on cryptorchid stallions (retained testicles) & spaying mares (removing ovaries) for many years. In order to do these procedures in a less invasive way, we have just obtained the training, equipment & supplies needed to do these procedures & others via LAPAROSCOPY. This is often referred to as a ‘minimally invasive technique’. Rather than using an incision large enough to allow the surgeons arm into the abdomen, small incisions are made, the structures are visualized & surgically managed through small holes using a video camera system & specialized instrumentation. These smaller incisions equate to less pain & shorter healing times for the patient. We are excited to offer this new minimally invasive surgery technique to the equine community.